Both credit unions and banks offer FHA loans. 1. Do Credit Unions Require Private Mortgage Insurance? Both credit unions and banks provide consumers with a variety of financial products and services that include mortgages and home loans. While lending options vary from institution to institution, there are pros and cons to financing options available through banks or credit unions as a whole. 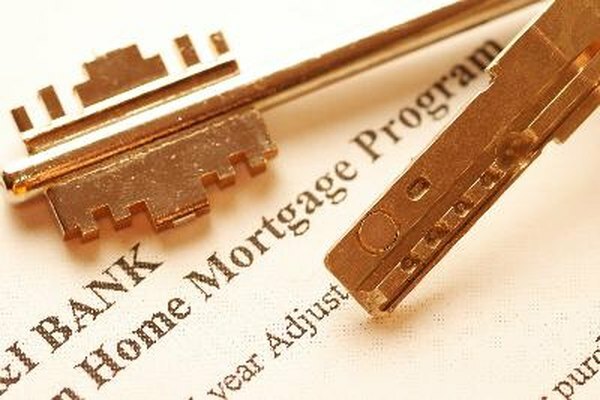 Despite significant differences between loan options, certain types of mortgage programs are offered through both types of institutions. When you take out a mortgage, your loan closing costs include third party vendor fees that cover the cost of the appraisal, title insurance and other unavoidable expenses. However, many institutions also charge an origination fee that amounts to a processing fee you must pay simply for taking out a loan. Origination fees and other processing costs are common at banks that are publicly traded for-profit corporations. In contrast, credit unions are member owned nonprofit entities. As such, credit unions attempt to break even rather than make a profit on home loans. Therefore, processing costs including origination fees can often be avoided if you take out a mortgage at a credit union rather than a bank. Banks and credit unions are both required to comply with federal borrowing laws such as the Fair Lending Act that prevent entities from discriminating against borrowers based on factors such as race or gender. However, credit unions are also chartered at the state level and each union has a limited membership base. Some credit unions only admit members who work for certain firms, while others only admit members who live in certain towns. You cannot get a credit union mortgage if you cannot qualify to become a member. No such membership limitations apply to banks. However, banks often have tougher underwriting standards than credit unions. This means qualifying members with poor credit can often more easily get loans from credit unions than banks. Banks and credit unions fund mortgages either with cash borrowed from other institutions or with funds held in the deposit accounts owned by customers or members. For every dollar that an institution loans out, it must keep a certain amount of cash on hand. Therefore, an entity's financing pool is directly affected by its member or customer base. A credit union with a limited deposit and customer base has less cash to loan out in the form of mortgages than a commercial bank that operates in multiple states. Lack of cash can cause an institution to curtail lending. Banks and credit unions can free up cash and originate new loans by selling existing mortgages to investment firms. Both credit unions and banks sell loans to government-backed mortgage enterprises Freddie Mac and Fannie Mae. These firms impose underwriting guidelines on institutions that require borrowers to have certain minimum credit scores and debt-to-income ratios. Likewise, both banks and credit unions offer loans that are insured by the Federal Housing Administration. The FHA, like Fannie and Freddie, also imposes underwriting guidelines on institutions. Consequently, Freddie Mac, Fannie Mae and FHA loans are largely the same in terms of rates and cost whether obtained from banks or credit unions. Bankrate: Credit Unions vs. Banks: Which is Better for You? How Do Mortgage Draws Work?